Larson Electronics, industrial grade lighting leader, released a new 200 watt high bay LED light fixture that produces 30,000 lumens of white light and operates on 100-277V AC. This cold forged LED fixture is ideal for outdoor lighting, wet locations, commercial spaces and many other general lighting applications. The Larson Electronics GAU-HB-40L-LED-WP-WCM high bay LED provides operators with a powerful, energy efficient LED alternative to traditional high maintenance fixtures. 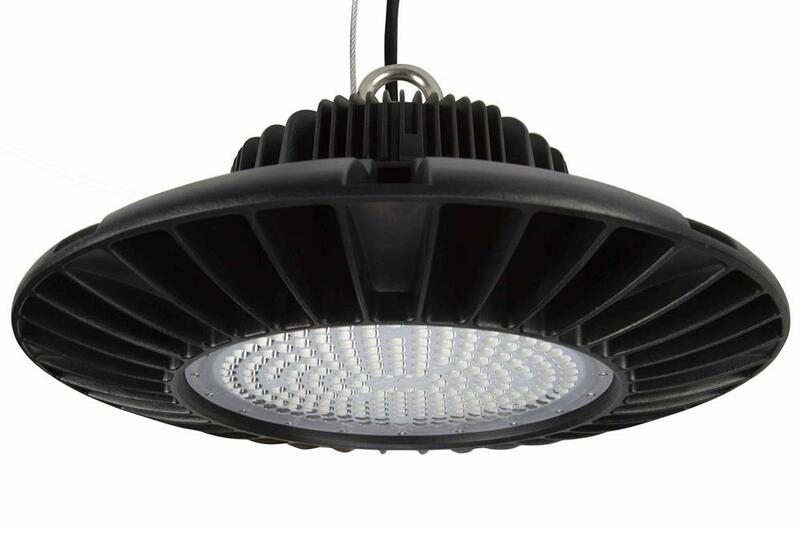 The featured LED technology in this high bay allows the fixture to provide a brilliant 30,000 lumens of high quality light, while only consuming 200 watts. The advanced LED technology allows this unit to boast an excellent 50,000+ hour rated lifespan with a CRI of 80. The circular fixture produces a 90º beam angle with color temperature options of 3000K, 4000K, 5000K or 5700K, allowing operators to choose an output best suited for their specific needs. Additionally, the GAU-HB-40L-LED-WP-WCM was made using a cold-forging technique, which helps to enhance the lamp’s thermal resistance. The GAU-HB-40L-LED-WP-WCM high bay light fixture is IP65 rated, making it a suitable light for outdoor and humid industrial environments where elevated lighting that can withstand environmental changes is required. At just 5.24 pounds, this lightweight and compact fixture is constructed of corrosion-resistant aluminum, providing excellent durability and resistance to vibration and impact. An acrylic (PC) lens further protects the 119 LED chips. This high bay fixture can be hook mounted, bracket mounted or pipe mounted. When secured using a mounting bracket, the configuration offers 180° of rotation of the lamp head.